...Gears of War 3, of course. And really, what would a Gears of War release be without an accompanying accessory launch? But before we get into the Gears gear (that was a groaner, I know) let's take a look at the accessory for that other game. Shipping to retailers on September 26 is Microsoft's new Wireless Speed Wheel controller for play exclusively on Xbox 360﻿. Aimed at novice and veteran racing enthusiasts alike, the wireless controller features intuitive motion steering with force feedback to feel very bumps and skid on the road. While its released has been timed around the launch of Turn 10 Studios' upcoming Forza Motorsport 4, the Wireless Speed Wheel ﻿is compatible with all racing games out of the box, with a caveat. 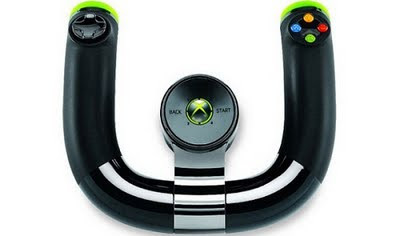 Microsoft was quick to point out that the wheel controller does not contain shoulder buttons which may limit functionality in some racing games﻿. So what buttons does it contain? There's two trigger buttons for gas and brake at the tip of each handle, a D-pad for navigation, the standard A,B,X,Y buttons for interactions﻿, and a Guide button that glows when turned on. Looks like Microsoft is going to give the wheel a sturdy feel to bring out the realism of racing while balancing the comfort of a controller. The wireless controller, which was designed by Epic Games and Microsoft collaboratively, will be shipping to retailers on August 11 for a suggested retail price of $69.99﻿. While that is on the pricey side, the controller features custom packaging and design, a Transforming D-pad, and the Infected Omen Weapon Pack DLC which features customer skins for the game’s five starting weapons: Lancer, Retro Lancer, Hammerburst, Sawed-off Shotgun, and Gnasher Shotgun﻿. The controller takes two AA batteries and will also be compatible with the Microsoft Play and Charge kit (sold separately). 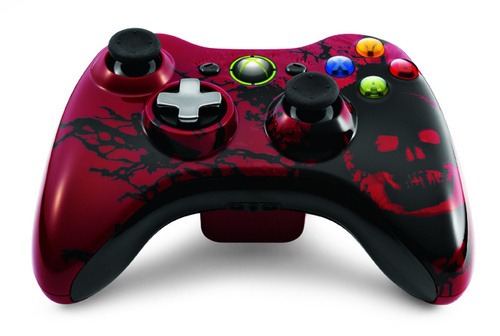 Featuring a matching design is a brand new Xbox 360 Limited Edition Gears of War 3 console bundle which comes with two custom-designed Xbox 360 wireless controllers, a 320GB hard drive, built-in Wi-Fi connection, a copy of Gears of War 3, a wired headset, and a download token for the Infected Omen Weapon Pack and the Adam Fenix character for use in multiplayer. ﻿The Limited Edition Gears of War 3 bundle ﻿will be available on September 20 for a suggested retail price of $399.